ATLANTA — With the rolling landscape and park benches on a perfectly-groomed lawn, you might think you were in Bavaria, which is exactly what Porsche Cars North America intends with its Porsche Park-in-the-Paddock – located amongst the vintage race cars at Mazda Raceway Laguna Seca for Porsche Rennsport Reunion IV, October 14 – 16, 2011. This area, located behind the media center (where the tire companies usually set up for a race weekend), will feature an authentic German biergarten as well as German food and and a park atmosphere so Rennsport attendees can take a break from the on-track activity and absorb the experience. But Rennsport fans will still know that they are at a Porsche event, as the Park-in-the-Paddock will have plenty of sports car activity as well, according to Bernd Harling, Porsche’s Principal Communications Counsel and coordinator for Rennsport. “Besides the food and drink, our Park-in-the-Paddock will include a center stage where driver introductions and all the autograph sessions will take place and live music will be played, as well as the very popular model car display, photo opportunities with the CARS movie star Sally Carrera – maybe our most famous 911 – and a Porsche Sport Driving School activity center,” said Harling. “We also hope to have a sneak showing of a future Porsche model in the Park, but it’s a little too early to be able to confirm its appearance,” Harling teased. Other activities around the paddock are taking shape as well for the October event, according to Harling. “Porsche Motorsports North America, headquartered in Santa Ana, Calif., will have a display not only to show its modern and vintage race car parts and service capabilities, but to encourage the many Porsche race car owners to take advantage of the company’s free technical advice offered to anyone who asks,” said Harling. With the Porsche 911 being the featured race car of Rennsport IV, fans will also be able to view two 911 displays which help capture the history of this iconic sports car. 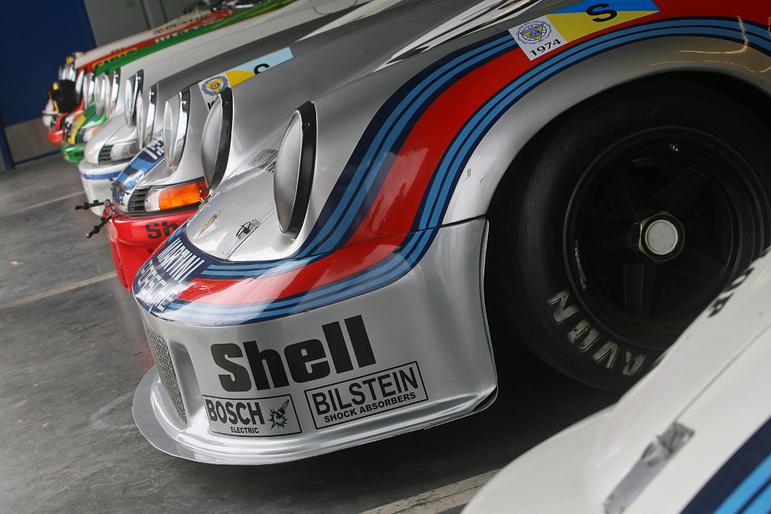 The first is a special collection of the most significant 15 race cars in 911 history. Will you agree with the organizer’s choice as there have been hundreds of important 911 race cars? This display in the pit lane garages will surely spark a friendly debate, but, with more than 100 racing 911s in the paddock, everyone’s personal choices won’t be far away. The other 911 display is being assembled by the Porsche Club of America, and proved to be very popular at Porsche Rennsport III at Daytona in 2007. In order to show the progression of the Porsche 911 model, the club has assembled one car from each year, starting in 1965, when the 911 first appeared in the U.S., until today’s 2011 Porsche 911 GT2 RS. PARK-IN-THE-PADDOCK– The Mazda Raceway Laguna Seca Paddock will be transformed into a Porsche immersion zone for attendees at Porsche Rennsport Reunion IV featuring a genuine German biergarten, exclusive Porsche 911 displays and activities, and special race cars in a relaxing atmosphere. 16 CYLINDERS – After its success with the early Porsche 917 race cars, the company wanted to build a car with even more horsepower, and tested this 16-cylinder engine before settling on the twin-turbo 12-cylinder powerplant that eventually powered the Penske Porsche 917/30 driven by Mark Donohue. This one-off car, never shown in public before, made its world debut at Porsche Rennsport Reunion III in 2007 and will be sent from the Porsche Museum in Germany for Rennsport IV as well. CONCOURS – Always a big part of any vintage gathering, the Rennsport concours d’elegance will be a highlight at Porsche Rennsport Reunion IV. At Rennsport III in 2007, the crowd gathered around the best in each class, showing production-based to prototype race cars, from the 356 to the 962. Porsche Rennsport Reunion IV will be the world’s greatest gathering of Porsche race cars and the drivers that drove them to victory, held at Mazda Raceway Laguna Seca from October 14 to 16, 2011. Hosted by Porsche Cars North America, it will assemble the wide variety of Porsche’s most historic racing models from the nimble 550 Spyder of the mid-Fifties through the mighty 917 and 956/962 of the Seventies and Eighties to the highly successful RS Spyder of the last decade. Special tribute will be paid to the numerous racing versions of the Porsche 911 and their countless victories on the dawn of what will become another milestone of this iconic sports car. 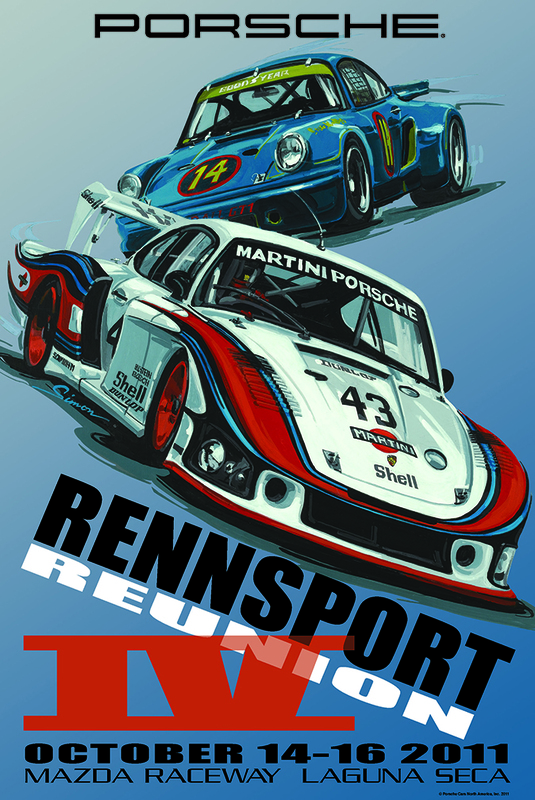 Additional details of the Porsche Rennsport Reunion IV are published on http://www.porsche.com/usa/rennsport-reunion-iv/, and Mazda Raceway Laguna Seca’s web site ( http:// www.mazdaraceway.com ). Ticket information is available by contacting 800-327-7322 or online at http://www.mazdaraceway.co m.
While the cars are by invitation, the event itself is open to the general public. Special guests, celebrities, and era pilots will be on hand, and fine wines and gourmet specialties will be on the menu. Importantly, all net proceeds from the event will directly support lung cancer research. For more information on the Porsche Race Car Classic or to purchase tickets visit www.porscheracecarclassic.com or contact Mr. Heinrichs at 775-691-2217. ATLANTA, April 13, 2011 – Porsche Cars North America (PCNA) announced the appointment of Brian Redman as Official Ambassador to Rennsport Reunion IV. In his new role Redman will serve as an advisor to PCNA’s organizing team in the months leading up to the October 14 to 16 event and represent the company vis-à-vis race fans and participants in all Rennsport related matters. “I can’t think of a more qualified person than Brian to help us realize another successful Rennsport Reunion”, said Detlev von Platen, President and CEO of Porsche Cars North America. “Not only was he instrumental in designing and organizing the previous venues, but with his own colorful racing history, not the least with some of our most famous race cars, Brian Redman personifies the spirit and fascination that we want to encourage with this next gathering of Porsche race cars and their designers and drivers”, von Platen added. Starting in 1959, Redman’s career has spun more than four decades of racing sports cars as well as Formula 5000 and Formula One. Although making a name for himself as an all-round talent, his biggest triumphs came in racing sport prototypes in the world’s most famous and notorious venues. From Nürburgring, Spa, Monza, Imola, the Targa Florio, Brands Hatch, Zeltweg, Watkins Glen to Daytona and Sebring, Redman won them all. As a member of 1969 factory team he helped Porsche win the World Manufacturers Championship for the first time in the 908LH and 908/2. He then repeated this feat in 1970 with the 908/3 and awesome 917K. 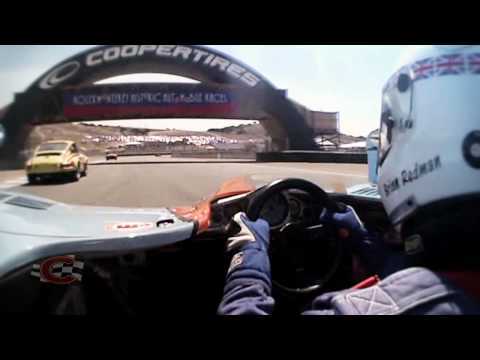 Redman still drives vintage race cars, organizes and promotes historic automotive events and provides individual and group driving instructions. A member of the Detroit and Sebring halls of Fame, was inducted into the Talladega Hall of Fame earlier this year. Special tribute will be paid to the numerous racing versions of the Porsche 911 and their countless victories on the dawn of what will become another milestone of this iconic sports car. Additional details of the Porsche Rennsport Reunion IV will be published on Porsche’s press web site (press.porsche.com), and Mazda Raceway Laguna Seca’s web site (www.mazdaraceway.com), as they become available. 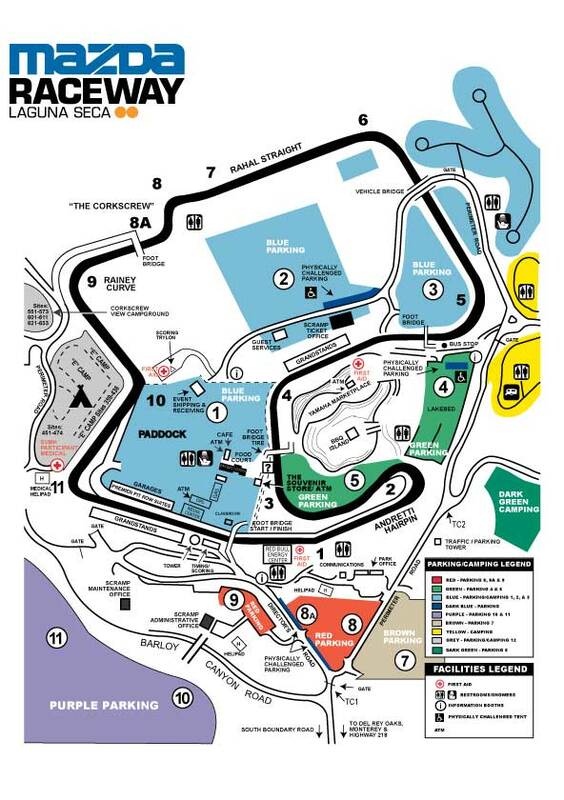 Ticket information is available by contacting 800-327-7322 or online at www.mazdaraceway.com. Source: Photos and Press News at Porsche Press Database at http://press.porsche.com/.